Holidays to Palma Nova are popular for couples and the young and lively. 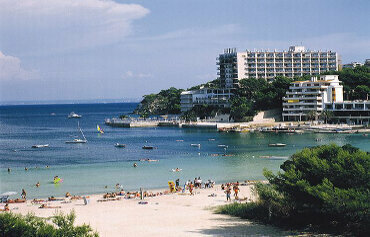 For the ultimate relaxing getaway, unwind on the golden sandy beaches of the stunning Majorca resort of Palma Nova. Famous for its lively nightlife, there's a whole range of activities to do on your holiday, even if you don't fancy painting the town red! Like many of the most popular destinations in the Balearics, a holiday to Palma Nova is a fantastic choice for families, couples and groups of friends alike. Can you think of a better way to enjoy the summer temperatures of up to 25°C than on one of Palma Nova's picturesque Blue Flag beaches, with a cooling glass of fruity sangria or local beer in your hand? The gorgeous beaches of Son Matias, Son Caliu and the resort's namesake, Palma Nova are definitely worth visiting. You can work on your tan, or get involved in the watersports and glass-bottomed boat rides. When you fancy a refreshment, you can pop into one of the bars and restaurants by the beaches for a quick bite to eat before getting back to your sunbathing. Family-friendly activities to enjoy on your Palma Nova holiday include crazy golf and go-karting, or, unleash your inner explorer on Majorca's most famous hiking trail to the 15th century hilltop castle, Castell d'Alaro. Once you're at the top, you'll be able to admire the magnificent panoramic view, so make sure you bring your camera with you! For a memorable day out, visit Marineland and enjoy the dolphin and sea lion shows. Party animals will adore the thriving nightlife in Palma Nova. Channel your inner diva at the karaoke bars or visit the bustling bars and clubs. If you're really keen to let your hair down, you'll definitely want to visit Palma Nova's most famous bar, Banana Joe's Bar. The resident DJ plays a fantastic mixture of old school, dance and party music for you to dance the night away to! When you've exhausted the nightlife in Palma Nova, the legendary party resort of Magaluf is less than 10 minutes away, so why not make a night of it? If you fancy a quieter evening in Palma Nova, you'll certainly be spoiled for choice with the fantastic choice of restaurants in the resort. You can experiment with different flavours and enjoy the Chinese, French, Italian and Mexican restaurants. Or, why not treat yourself to a traditional tapas meal - a holiday to Spain simply wouldn't be complete without it. If a Palma Nova holiday sounds like just what you're looking for, call Hays Travel today and trust us to book a exciting getaway to Majorca for you. We have over 37 years of experience in booking memorable breaks in Spain and the Balearic Islands, and we have been voted the UK’s Best High Street Travel Agent - so you can guarantee your holiday is in safe hands with Hays Travel. Sitting on the Torrenova headland, the 3 star Hotel Intertur Hawaii Mallorca enjoys a beachfront location and stunning views across Palma Nova Bay. 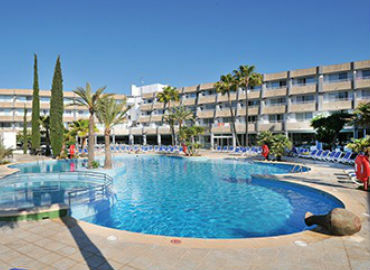 A popular choice with families, there's plenty of facilities on site and the bustling centres of Palma Nova and Magaluf are just a short stroll away. Set on a headland between Magaluf and Palmanov and just 150 metres from the beach, the TRH Palma Nova gets the thumbs up for its location. This young and lively 3 star hotel is the perfect place to unwind poolside by day and then hit the town when the sun goes down. When it comes to swimming and sunbathing, you have got the choice of a freeform pool outdoors and another heated one indoors. 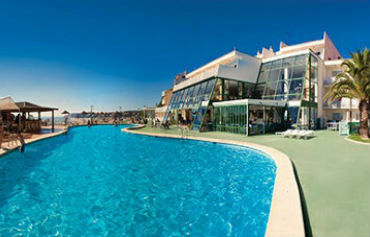 When it comes to location in Palma Nova, the Sol Lunamar Aparthotel is hard to beat. This attractive 3 star property is just a hop, skip and jump from the sandy beach. The pool area takes centre stage during the daytime. 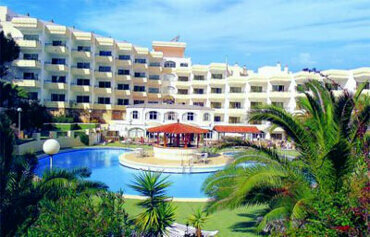 There is a large freeform beauty surrounded by plentiful sun terraces and sun beds. Chill out and catch the afternoon sun, safe in the knowledge that the little ones will be having fun in their own section of the pool. 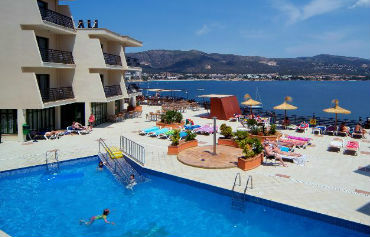 The Tropico Hotel is in a stunning location, close to the golden sands of San Matias Beach in Palma Nova. This familyfriendly all inclusive hotel in Majorca offers a plenitude of onsite facilities, tasty dining and modern guest rooms. The Hotel Viva Palmanova sits close to the beach in Palmanova. 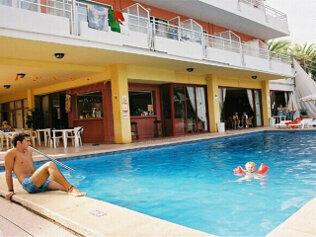 This family friendly Majorca hotel goes all out to impress and offers a plenitude of facilities for all ages. 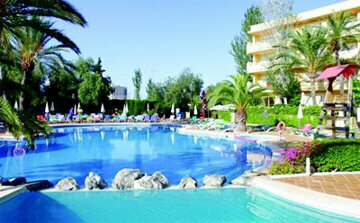 It's fun in the sun all the way when you stay at the Sol Mirlos Tordos All Inclusive in Palmanova. This familyfriendly Majorca hotel offers a wealth of sports and leisure facilities, tasty dining choices and stylish accommodation. The TRH Torrenova has bagged itself a prime location in Palmanova, overlooking Son Matias Beach and the Mediterranean Sea. 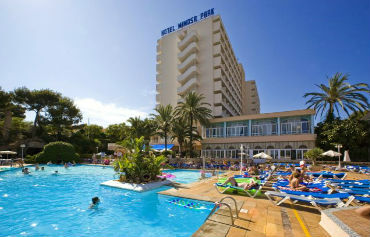 This Majorca hotel sits in lush gardens and offers plentiful onsite facilities and stylish accommodation. This recently refurbished Palmanova hotel has it all family friendly fun, a welcoming atmosphere, spacious accommodation, tasty dining and a plenitude of onsite facilities. 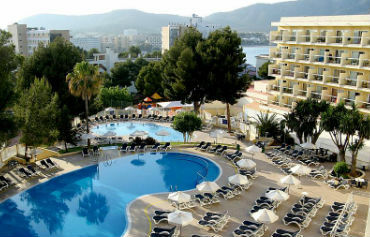 This familyfriendly Majorca hotel offers a wealth of sports and leisure facilities, tasty dining choices and stylish accommodation. Families of all ages are sure to love Hotel Marina Torrenova. It's jam-packed with water slides, play parks, lively entertainment, and delicious buffet restaurants making it the perfect sunshine escape. The lively centre of Palma Nova is home to the Hi Mimosa Park Hotel. With the beach just a short stroll away and a multitude of bars and clubs close at hand, this Majorca hotel couldn't be better placed. Overlooking San Matias beach, this hotel serves up stunning views from every angle. 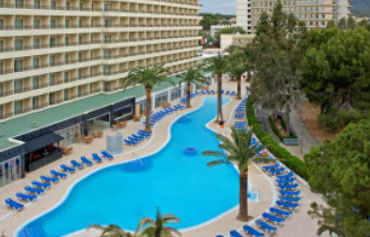 This complex is in a peaceful spot that's still within easy walking distance of both the Palma Nova and Magaluf centres. Holidays in Palma Nova mean hot dry summers and very little rain. Majorca has over 300 days of sunshine each year. Summer average temperatures usually hover around the mid 20ºs. Summer weather in Palma Nova is exceptionally pleasant. Holidays in Palma Nova offer a wide choice of activities, including water sports, glassbottom boat rides, a wild west theme park, crazy golf, gokarting, and fun family days out at Marineland, which features dolphin shows and sea lions. Those who fancy a break from the hustle and bustle can explore the Castell d'Alaro, Mallorca's most popular hiking trail. This trail offers stunning panoramic views and features a 15thcentury hilltop castle. Holidays in Palma Nova are renowned for their lively nightlife and offer a good choice of English pubs, karaoke bars and discos. 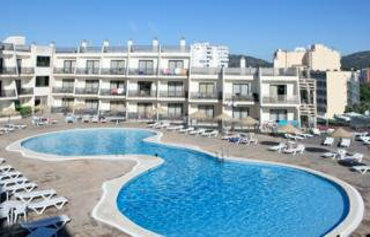 For more hectic nightlife, partygoers can head to the pulsating nightclubs and bigname DJs of Magaluf. Along the beachfront in Palma Nova youll find all the fast food outlets you could want from McDonalds to Burger King, KFC and Pizza Hut. International restaurants such as Italian, Chinese, Mexican and French feature too alongside traditional Spanish tapas bars.